I’m happy to have made the list of Relevance’s 25 top digital marketing influencers to follow this year. On the full list, you’ll find me at lucky number seven, included because as an investor, startup enthusiast, marketing expert and entrepreneur, I’ve worn a number of hats that inform this niche. 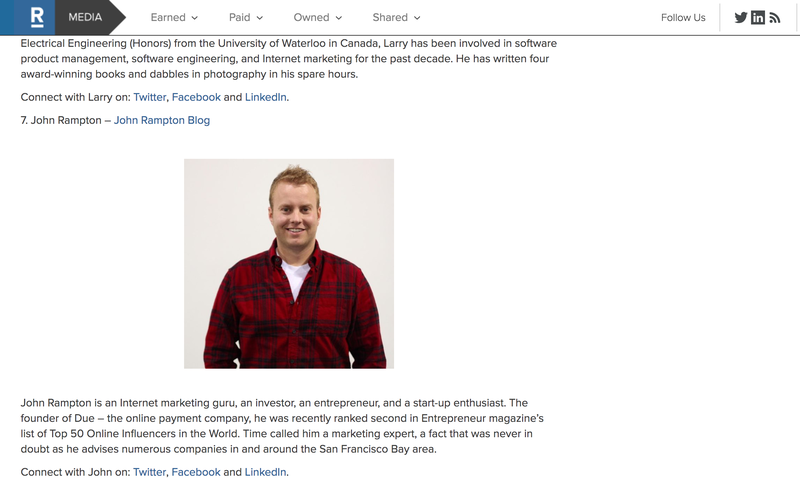 I also came in second for Entrepreneurs’ list of top 50 online influencers. I enjoy advising a number of companies in the San Francisco area and look forward to following my fellow influencers on the Relevance list as well. Keeping up with leaders in the field is one of the best and easiest ways to step up your own game. Jeff Bullas also made the list and boasts an eclectic background including consulting, speaking around the country, acting as a strategist, and of course blogging. He specializes in personal branding and the online corporate world, excelling at using social media to maximize client potential. He’s also the author of the book “Blogging the Smart Way – How to Create and Market a Killer Blog with Social Media,” an Amazon best-seller I highly recommend. Check out Aleyda Solis, a worldwide SEO guru, and consultant at Orainti, the company she founded to offer services to any size of business. Her specialty is helping businesses increase traffic, web ROI, and organic search visibility. She’s made the Forbes list of the top 10 online marketers to follow in 2017 and is an expert in multi-device SEO approaches.